Occupational Therapy might not be familiar to all! Thinking about the term 'occupation', OT's like to define our therapeutic role as looking at how a child 'occupies his/her day' and addressing challenges they have within those areas. If you notice challenges with balance, coordination, self-regulation, school skills, social interactions, self-care, play skills, focus or attention, we suggest connecting with an occupational therapist. How do I start the process of enrolling my child in occupational therapy? 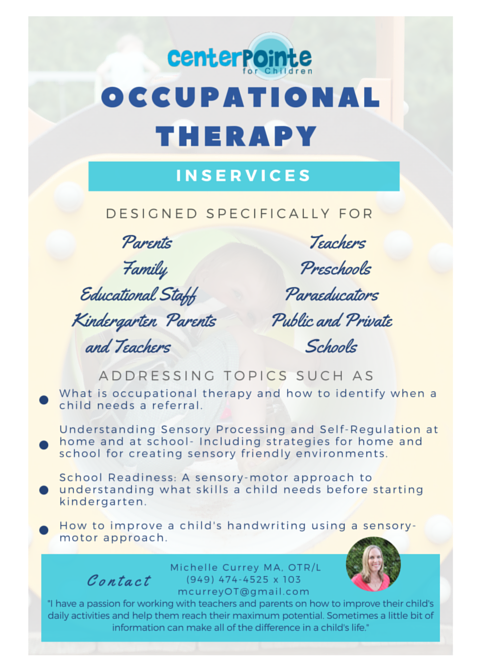 Sometimes, a teacher, physician, friend or therapist might mention concerns that they are seeing with your child related occupational therapy services. You might also have a hunch that OT might be something to pursue. Give us a call or send us an email! Right off the bat, we will ask you if your child has participated in OT before, and if they have had an OT evaluation. If not, an evaluation is the place to start, and we can explain all of this to you when we connect! What are the Sensory Integration and Praxis Tests? Otherwise known as the SIPT, the Sensory Integration and Praxis Tests are used by occupational therapists who specialize in assessing how a child is processing sensory information and integrating this information for functional use. Therapists participate in extensive training to administer and interpret the SIPT, so if you feel your child might have challenges with taking in sensory information, ask about your therapist's training in this area! Does Centerpointe for Children take my insurance? We do not bill insurance directly, but are happy to provide you with the information that you will need to submit your invoice to your insurance company for possible reimbursement. If this is an avenue you would like to pursue, we suggest checking in with your insurance company before getting started to ask about occupational therapy coverage. Not sure about insurance codes or what to ask? Just ask us! We are here to help! How long is an occupational therapy session? Our sessions are 50-minutes of direct 1:1 treatment, and the last couple of minutes are dedicated to talking with parents/caregivers about the session. How many other children will be in the gym while my child is in therapy? We recognize that occupational therapy clinics can get busy! This is why we cap our child/therapist duo to 3 children and their therapists in our space at a time, maximum! Considering we have the larger gym area and two smaller rooms available, we think this gives everyone a little breathing room! Can I watch my child's therapy session? Of course! We actually hope that you do every now and then to really understand what we do, why we do it, and how we do it! How much does an OT session cost? Please contact us for evaluation and treatment rates. The duration that your child will be in OT will be recommended as an evaluation has been completed and the therapist becomes familiar with your child. Everyone learns and changes at different rates, but we can tell you one thing: Following through with activities that your therapist suggests at home will expedite your child's therapy with us! How do I explain sensory integration to family members, friends, and professionals? Explaining sensory integration can be tricky if you are just beginning to learn about it! We suggest checking out our "favorite things/resources" section here on our website and watching some of the short videos, grabbing a book or two, and reading up to familiarize yourself with the terms you will hear us refer to often! Depending on your child's identified needs, we will occasionally visit a classroom or home to provide insight and support related to the occupational therapy your child is receiving. Unfortunately we do not currently offer routine treatment within your home or in the classroom. Absolutely! Collaborating with those working with your child is our dream come true! Before we contact anyone though, we will ask you to complete a release of information form, giving us your written permission to contact anyone. What can I do at home to support the OT services my child is receiving? Once paired with an occupational therapist, you will begin to receive individualized activity suggestions based on your child's OT goals and areas of need. We sometimes refer to these activities as a sensory diet, because the are activities that should be naturally woven into a child's day on a regular basis, similar to how we think about nutrition and diet. We also suggest checking out our blog, "Passport to FUNction" for playful and relevant therapeutic suggestions! Will my child grow out of these issues? We all change as we mature and develop. Sensory Integration concerns are not something that children grow out of. Early identification and treatment can make a huge impact on your child's physical development and psychological well-being. When we understand how a child processes sensory information, we can create individualized activities that give comfort and support sensory processing. A child who feels understood develops lifelong confidence and self esteem.